THE SEATTLE SCENE has nurtured numerous world-class drummers over the years – just consider Skip Moore’s cracklin’ rimshot work on The Ventures’ 1960 global hit “Walk—Don’t Run,” or Dave Grohl’s supercharging of Nirvana’s “Smells Like Teen Spirit” in 1991. But local audiences have also been exposed to other ace tub-thumpers who came touring through the area, from Lionel Hampton and Buddy Rich and their various bigbands, to Led Zeppelin’s John Bonham, & Santana's Michael Shrieve. Still, a good case can be argued that perhaps the most astounding drummer of all time was Gene Krupa (1909-1973) – & at his 1930s-1940s prime he played Seattle at least five times. 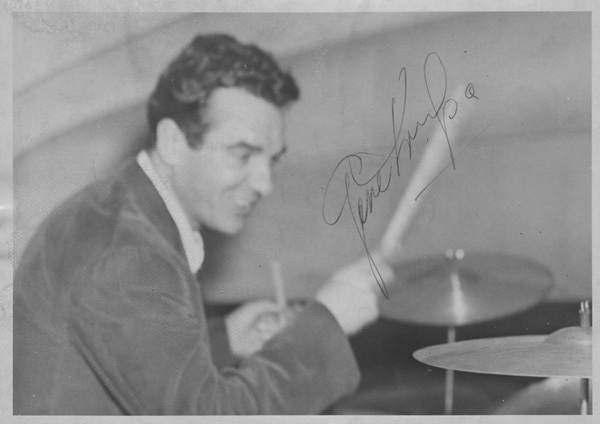 Rising up through Chicago’s Prohibition Era jazz scene, in 1934 Krupa joined one of the most high-profile ensembles of its day: the Benny Goodman (1909-1986) band. 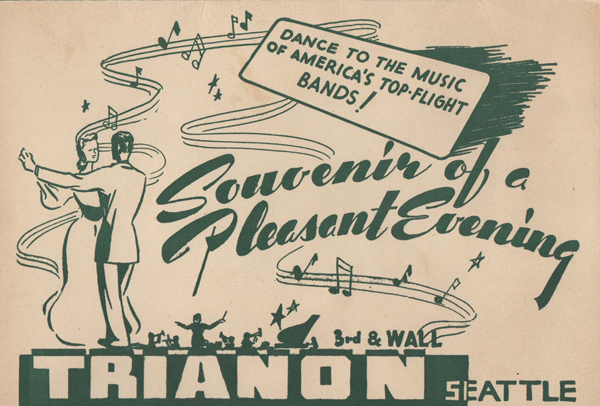 The first time that Krupa hit Seattle, he appeared with Goodman at the Trianon Ballroom (218 Wall Street). And it was that hit song, “Sing, Sing, Sing,” which is remembered by history for containing what are thought to be the very first extended drum solos ever cut for a commercial recording. 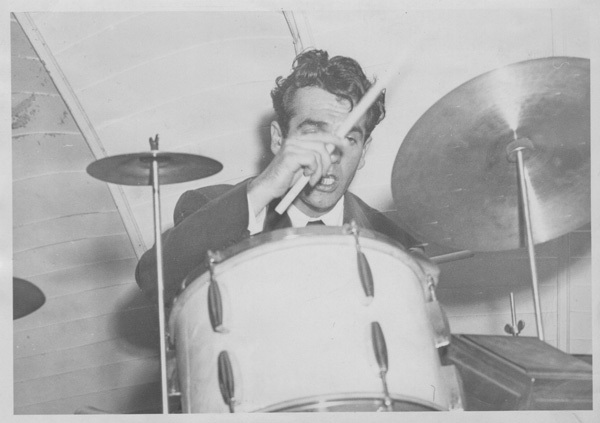 People loved Goodman’s records, but live in person, Krupa’s drumming simply drove their audiences wild. It also brought Krupa’s legions of fans back to see his own bigband at the Trianon when he made return appearances here on: May 24, 1940; September 5, 1941; March 11, 1946; & May 26, 1949. It was at that 1946 gig when a young Seattle photographer named Mike Michel captured some action shots of Krupa. 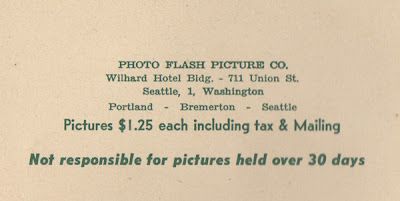 At the time, Michel worked for the Photo Flash Picture Company which was based in the Wilhard Hotel Building (711 Union Street). His job was to shoot pictures of various attendees and then hurry that film to “an onsite dark-room. There the negative would be rushed in developing the image, quickly cleared and the wet negative put in an enlarger to print…the exposed print was then put through a similar rush process, put on a hot tin to dry, put in a folder and then delivered to” those same customers within twenty minutes – at which point they paid the photographer $1.25 for this souvenir of their memorable evening out on the town. But in this instance, Michel didn’t sell the photos to Krupa, he instead had the star autograph some of them & he held onto them – until recently, when I acquired them.